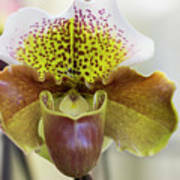 There are no comments for Bulldog Type Paphiopedilum. Click here to post the first comment. Now available from my photo portfolio: "Bulldog Type Paphipedilum". 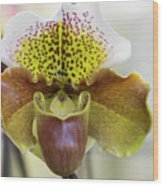 This photo of a bulldog type paphiopedilum orchid will be the focus of interest in any room, and you can now own a print of it. Simply click on the image, and you'll be taken to my online portfolio with Fine Art America. There, you can see my low pricing for loose prints and framed pieces of this amazing photo. While you're there, be sure to check out all my other wonderful photos - all priced to sell. Also available as a blank greeting card! Welcome to my photo site! I appreciate you taking the time to check out my photos - and reading more about who I am and my passion for photography. I began doing photography in my senior year in 1985. It was a black and white course, but really kick-started my passion for photography. I had a home darkroom at my parents' house up until 1987, when I moved out. I had to put my photography on hold for about a decade, when a friend of mine gave me one of his old digital cameras. I haven't looked back since! 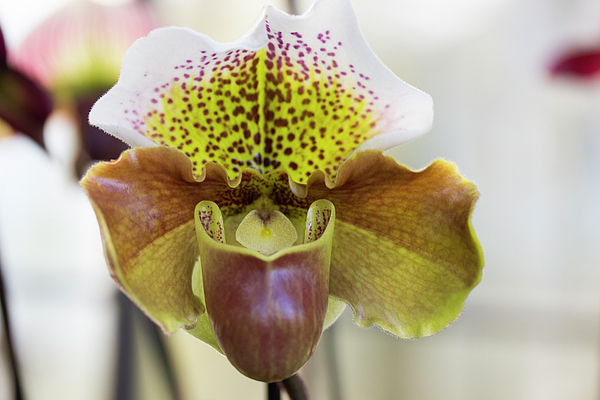 While I take many different types of photos, I now somewhat specialize in flower photography. Take a look around and see what I have in my portfolio. And thanks for stopping by!